There is always a right time for ice cream…. don’t you agree. I do love good ice cream and this recipe is a great one to have up your sleeve, ok I do have an ice cream machine, and it makes it nice and simple, but if you don’t have a machine, it is possible to make ice cream without one. (See Recipe Notes below). If you don’t want the bother of making your own ice cream, then go and buy a good vanilla ice cream and then just mix in the honeycomb, you will be glad you did. 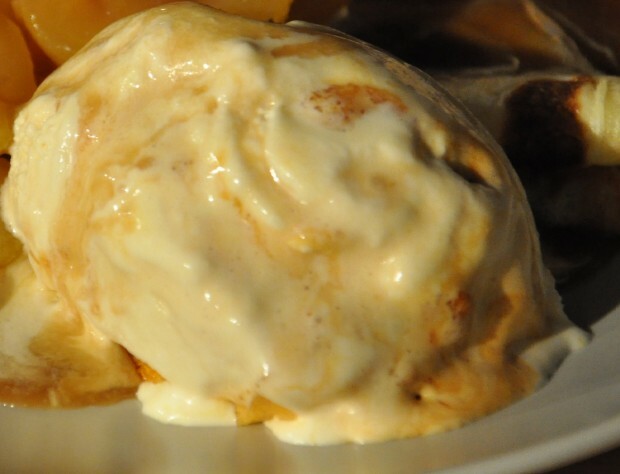 This delicious ice cream is only added to by the wonderful honeycomb, which is in its self not difficult to make, but you do need to take extreme care, and please it is not one for the children to make, except with an adult there, as the hot bubbling sugar for the honeycomb is extremely dangerous ……. The recipe for the Honeycomb is here , once you have mastered it you will be very pleased that you have…. Any left over honeycomb should be stored in a plastic bag in the freezer as it will melt otherwise. The base of your ice cream is a nice vanilla custard, that is then poured into the ice cream machine and it then does the hard work. Make the ice cream first as there will be plenty of time to make the honeycomb while the custard is cooling and in the ice cream machine. Start by pouring the milk and cream in a pot and heat until just below boiling point, you will see small bubbles coming around the edge of the mixture in the pot. In a medium bowl, whisk the sugar, yolks and vanilla, you can use a hand whisk for this, as it will create less bubbles, but make sure the sugar and egg mixture is well combined and getting thick. When the milk and cream mixture is ready, continue whisking and slowly pour in the hot milk mixture into the egg/sugar mixture, it helps if you can pour it down the side of the bowl, this makes sure you don’t have vanilla scrambled eggs. Pour the mixture back in to the pot and continue to cook over a low heat, (DO NOT ALLOW THE MIXTURE TO BOIL), stirring all the time until the custard has thickened to just coat the back of your wooden spoon. Remove the pot from the heat and allow the custard to cool, you need the mixture to be cold before adding to the ice cream machine. While the custard is cooling, make the honeycomb as per the recipe. Pour the cold custard in an ice cream machine and churn the mixture according to the instructions. 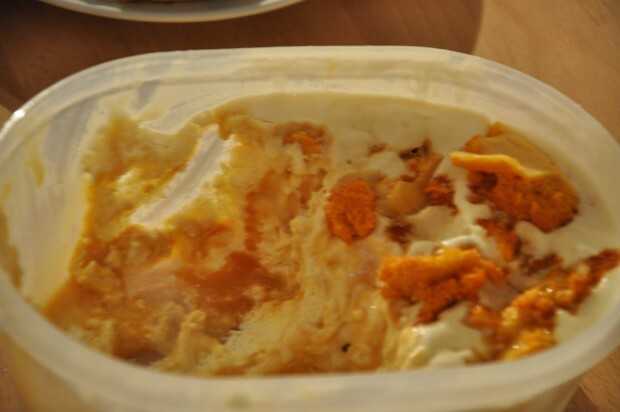 When the ice cream is made, take a suitable freezer container and add some honeycomb to the bottom of the container, scrape some of the ice cream into a freezer container and add some honeycomb and fold through into ice cream, add more ice cream and honeycomb to your taste. Put in the freezer until solid. Any extra honeycomb should be stored in a freezer bag and kept in the freezer or it will melt. 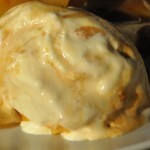 I do hope you enjoy this wonderful ice cream it is a real treat…..
Rich creamy vanilla ice cream with homemade honeycomb. Pour the milk and cream into a medium pot and heat, until it is just below boiling point. Add the egg yolks, sugar and vanilla into a large bowl and whisk until well combined and creamy. When the milk/cream mixture is ready, slowly pour the mixture into the bowl with the eggs and sugar, continue whisking all the time, to ensure that the egg mixture does not scramble. Once the mixtures are well combined, pour the mixture back into the pot and place back on a low heat. DO NOT ALLOW THE MIXTURE TO BOIL. Continue to mix the mixture on the heat until it thickens. It should coat the back of a spoon. Once it is ready, remove from the heat and leave to cool. To speed up the cooling, I often pour very cold water into the sink and place the pot into the sink, make sure the water is only half way up the side of the pot, you do not want water getting into the custard. Once the custard has cooled down, you can leave in the fridge until required, or pop into the freezer for 10 minutes. You need the custard to be very cold before adding to the ice cream machine. Once the custard is very cold, start your ice cream machine and pour in the custard and continue to churn as per the manufacturers instructions. When you have ice cream, take a freezer container and add some chunks of honeycomb to the bottom, add some ice cream on top and then some more honeycomb, fold the honeycomb into the ice cream and add more ice cream on top and then top with additional honeycomb. Place a lid on top of the container and place in the freezer until firm. Place the ingredients in a big bowl then beat with an electric whisk until really thick. Fold through the honeycomb, transfer to a freezer container and freeze until solid.